Working from a home office can offer more freedom and flexibility – but there’s also a risk of work invading your home life. Here are some tips on how to avoid that happening. Ditching the office for remote working can help you get a better work/life balance. But you need to make a distinction between your home office and home life otherwise you might start to feel like you’re on-call 24 hours a day. 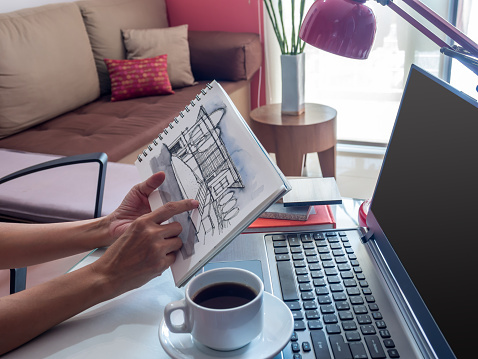 While it’s tempting to work in the comfy living room or take your laptop to bed, if you’re serious about remote working you need to set up a home office that is solely used during work hours. If you don’t have room for an office, find an area away from distractions that you don’t usually use during normal hours. Once your work day is done – turn everything off. Don’t just put your computer on sleep, but turn it off. Same goes for your work phone. In fact, turn off your home office lights, shut the door and walk away. You can always check back later if you’re expecting an email or call but if not, it’ll wait until morning. While the days of office workers having to wear suits might be disappearing, people still have work and home clothes. The problem with working from home is that people don’t tend to make this distinction. It’s a good idea to change clothing at the end of the working day to create a mental divide between ‘work you’ and ‘home you’. Avoiding the daily commute is one of the big benefits of working from home – but it doesn’t mean you have to spend all day indoors. After work, even if the weather’s not so great, try and get outside for a bit. Again, this will help you divide your day between work and home. It’s tempting to sleep-in occasionally and catch up the hours later. But you really need to set yourself solid working hours, otherwise your working day will just get longer and longer. You’ll also find you’re more productive and focussed if you have set hours. Finally, make sure your colleagues know your office hours. A good way to do this is to use signing in and signing out emails. This entry was posted in Blog on 24th March 2015 by Julie Tucker.